Vancouver Fashion Week FW19 - Interview With Designer Susan Rose Tovar of S.R.T. Please share a bit about your journey to embrace fashion design as a career. What sparked my passion for fashion design was by working for my aunty’s fashion business in Peru. My father suggested I help out within the business and after working for her after one day, I was hooked on and never wanted to stop. From that moment, it gave myself a turning point that I want to be part of the fashion industry. During the early days, I started learning by watching my mum sew clothes for myself and for my younger sister. Using her domestic Janome machine, she was able to create all these incredible outfits for us and I remember that I wanted to do what my mum could do, one day. And then during high school, I was able to do Textiles as an elective, while learning about basic skills in using a sewing machine. Later I went to fashion school at University of Technology, Sydney for four years, where I was taught an extensive amount of knowledge and skills from designing, conceptual thinking, draping, pattern making, drawing, marketing, collaborating with other designers and many others. There were opportunities where I was able to go overseas to learn different textile-based skills such as Wood Block printing in India and weaving in China. Who you are as a designer? Aesthetic? Customer? Brand? 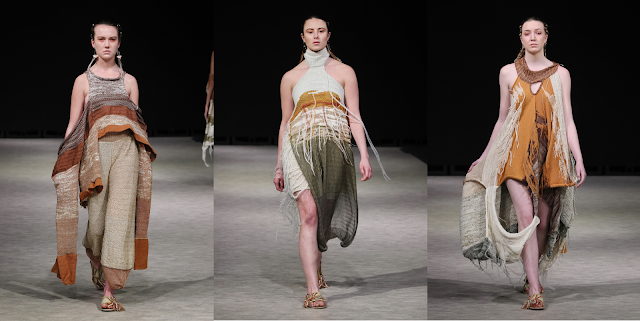 I am a contemporary and authentic emerging designer who has a strong sense of colour, texture and movement that can be explored in a progressive manner. I would like to change the perspective of knitwear by adding more colours, including gradients and volume, to silhouettes to add motion. As a former dancer, I tend to focus on movements within the garment to give a performance in front of people. 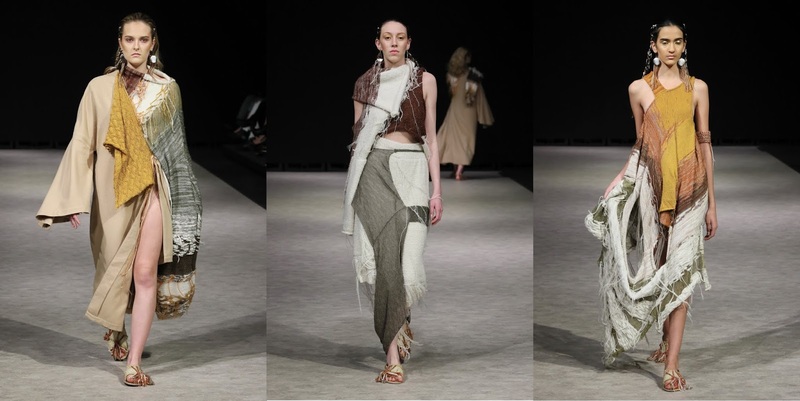 I can be defined as a new contender within fashion especially in knitwear, since I want to explore new dimensions and asymmetrical designs and how the cloth can be transformed into something that a woman can feel strong and proud. The brand S.R.T. explores how the material and cloth can be transformed into a garment with the central point of using colour and textile to assist in performing and engaging with the audience. Also there is a focus on learning about different cultures and their traditional techniques, to expose them in the world of fashion. For example, with the current collection, I was able to learn the art of natural dyeing, hand spinning yarns together and also weaving with Peruvian artisans in Cusco. What comes easiest for you as a designer? What is hardest? What comes simple for me as a designer is inspiration and capturing its essence in terms of colour and a message or a story behind the collection. I also getting excited finding new materials and using them in ways that have not been done before within a specific garment. The hardest part of being a designer is the editing part, because that step is when I need other perspectives to assist me in making sure the designs are clean, sleek and tell the story. Where do you find inspiration for new collections? How important is colour to your design process? I find inspiration everywhere and I am always curious, which keeps me interested and wanting to find out more. It could be a new place, sighting, object, a specific time or surrounding I have recently explored.Or it could be an event that happened to myself personally. I also love ancient history, so that is something that I could use in the future collections. Colour is definitely important in my design process because that is when I get to be artistic in drawing or taking photographs and collaging them together to find the connections of how colors can be composed together. I am more of a visual person, so the more photographs, the refiner the collection will be in terms of colours and textures and then it will be more refined as time progresses. My Fall/Winter 2019 collection, ‘El Vijie’, meaning ‘My Journey’ looks at the ability for colour and form to obstruct the body system to influence the way we view, touch and move through the spaces. Specifically I am interested in how this occurs in response to the erosion of the colours and contours of the Peruvian Rainbow Mountains, a culturally significant site, and a space that has a great affective quality on the body. This is explored through knit textiles in the use of alpaca yarns, a yarn that is featured in the Peruvian heritage, and also with the mixture of metallic yarns from Hong Kong and Japan to play with light and highlighting the alpaca yarns themselves. These fabrications assist in showcasing a numerous range of colours, capturing gradient and the ability for colour combinations to effect perception. Do you have a favorite look in this collection? I feel like they are all my precious looks because it's like having a connection or attachment with the clothes themselves. But I do like the wide-legged pants on the last look because they were dramatic and moved effortlessly on the catwalk. 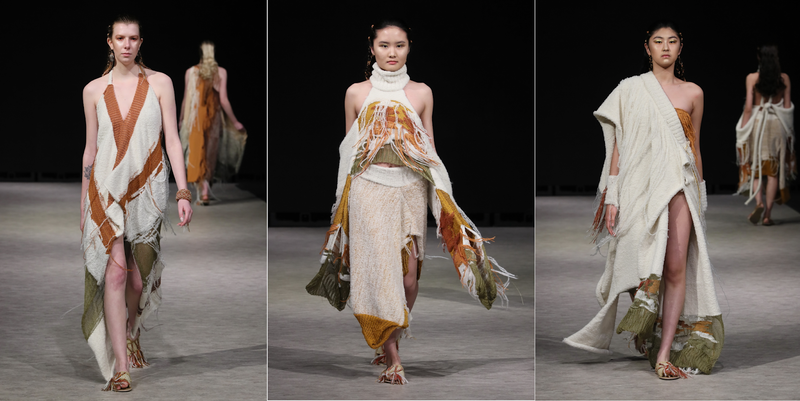 Also the garments with the knitted white fluffy textile were incredibly moving, since it adds texture in a significant way and drama to the collection. Anyone can definitely directly message myself on instagram or email if they want something from the collection. Also I am open and happy to do collaborations and commissions. As a designer, I am currently working on the next collection and drawing up some new designs, experimenting new techniques for the knitwear pieces, and finding new materials to work with. For the brand, S.R.T. the next step is to collaborate with my aunty’s fashion business to seek materials and production in Peru. Also to keep working on marketing the brand nationally in Australia and also internationally. My advice for young fashion artists out there is to stay true to themselves and also to stay strong behind your aesthetic and designs even though if its different because I believe the fashion industry is ready for different.